This is a quick follow-up post to my earlier one on the Voyage to Venus Doctor Who audio. I ended up putting my money where my mouth is and thought I should post about it. After the police bring in a strange mannequin that looks highly realistic, Professor Litefoot calls up his old investigating pal Mr. Jago to investigate the wharf where the body was found. This leads them into the crosshairs of a dangerous criminal organization. 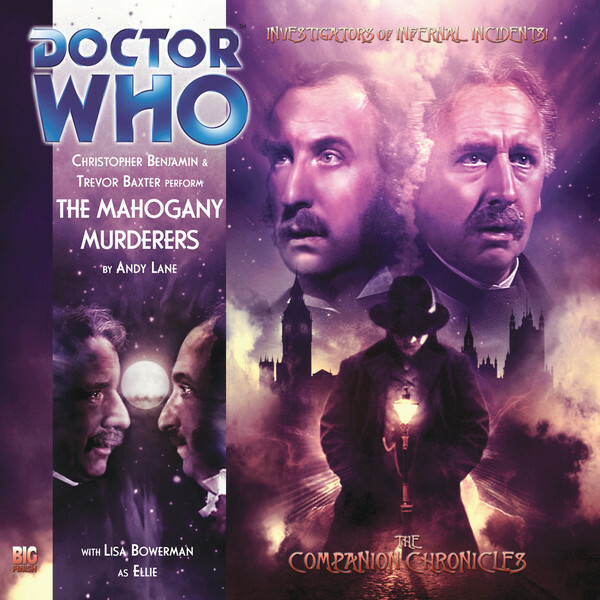 This is basically the pilot episode for the Jago and Litefoot series that Big Finish produced a year later. As such, it does a fantastic job of reintroducing the fact-oriented gentleman, George Litefoot, and the crafty showman, Henry Gordon Jago. They make several references to the Doctor Who episode The Talons of Weng Chiang where the characters originated, but not enough to scare off new listeners. The entire story is related by the two at a bar after the events, which mitigates some of the drama, but enhances the comedy. This allows the pair to play off each other to the benefit of the production. Professor George Litefoot is one of the first forensic scientists and a teacher. He works very methodically, but isn't put off by the strange and supernatural. He is depicted as a much more cultivated Sherlock Holmes and provides a great deal of comedy playing the straight man. Henry Gordon Jago is an impresario who is always on the verge of bankruptcy. He is sent out to investigate and comes into much more danger. Despite being a somewhat foolish character, he is a skilled conman and his strengths are presented effectively and often comically in this adventure. Ellie the barmaid is the only other character and serves mostly to facilitate the comedy and set the scene. Her voice actress, Lisa Bowerman, is also the director and does a brilliant job in both respects. The enemies are difficult to talk about without spoiling, but they provide a great deal of menace. Since this is told in flashback, they are also voiced by the leads who do a great job of making them sound different than our main characters. The story has three main locations: a bar, a morgue, and around the wharf. All three locations were expertly presented and easy to visualize. I normally have a bone to pick with clearly open endings, but this one has enough closure to leave you satisfied. The mystery is uncovered and the immediate evil is put to rest. Plus, it does leave a tantalizing ominous feeling for the rest of the series. I certainly hope it delivers of the level of intrigue that it creates. I was surprised at how simple and charming this audio is. It touches on the heavy subjects of old age and class without destroying the comedy. The cast is excellent and the mystery was entertaining. It had some steampunk elements, but worked more as a comedic Holmesian mystery. I'd recommend it not only to classic Doctor Who fans, but to steampunk fans as well. You can find it here and be sure to check out the rest of the Jago and Litefoot seasons.